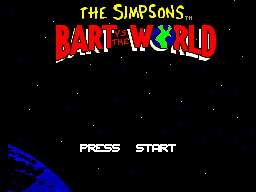 The Simpsons: Bart vs. the World, known in Japan as Bart World (バートワールド), is the sequel to The Simpsons: Bart vs. The Space Mutants. It was released among other platforms for the Sega Master System and Sega Game Gear. Main article: The Simpsons: Bart vs. the World/Magazine articles.